Keeping in line with its policy to only offer humanitarian assistance to civilians in African conflicts, Russia yesterday announced that it had dispatched a plane carrying food, blankets and other aid to war-torn Mali. French forces have for several weeks been fighting Al-Qaeda affiliated militias in the north of the country. An Il-76 cargo aircraft took off from Ramenskoye airfield near Moscow on Friday with a total of 40 tons of humanitarian aid on board, the Emergency Situations Ministry said. Sergey Lavrov, the Russian foreign minister, last week met with the United Nations special envoy for the region, Romano Prodi, to discuss the security and humanitarian situation in Mali. “Particular concern was expressed about the activity of terrorist organizations in the north, a threat to regional peace and security,” the Russian Foreign Ministry said in a statement after the meeting. Russian officials say they are concerned by the recent Al-Qaeda attack on an Algerian gas plant and the war in Mali. In recent statements to the media, Lavrov blamed the power vacuum created after the overthrow of Libyan leader Muammar Qaddafi for the current conflict between Al-Qaeda and the West in Africa. “Those whom the French and Africans are fighting now in Mali are the (same) people who overthrew the Gaddafi regime, those that our Western partners armed so that they would overthrow the Gaddafi regime,” Lavrov told a news conference recently. He also said that Russia has no plans to deploy troops to the Middle East or North Africa, preferring instead negotiations through the UN and regional organisations. “This is my answer to those who wonder why we are not fighting for our positions,” Lavrov said on the Sunday Night with Solovyov programme which aired in early February. “We will not be fighting for our position … and creating ‘another Afghanistan’ for ourselves; never, under no circumstances,” Lavrov said. 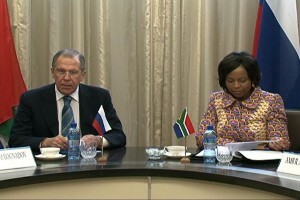 Lavrov also denied earlier media reports that Moscow would provide military assistance to French troops in Mali.